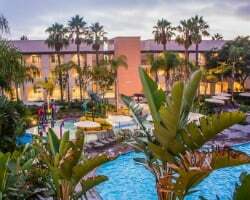 Immersed in endless sun and warm ocean breezes, the Grand Pacific Palisades resort in Carlsbad offers timeshare owners years of wonderful California getaways. Find your own spot at the resort by browsing discounted timeshare resales and rentals today. What’s My Grand Pacific Palisades Timeshare Worth? Right up against the crashing waves of the great blue Pacific, the Grand Pacific Palisades resort offers instant access to all the sand, surf, and sun in Southern California. Boasting a central location and an unmistakable SoCal vibe, the resort offers timeshare owners and other guests the experience of a lifetime. 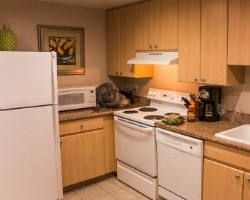 From the well-maintained grounds overflowing with tall, leaning palms and bright poppies, to the wonderful range of amenities that include an Olympic-size swimming pool, instant access to area attractions, and on-site restaurants, you'll finally have that home-away-from-home at the Palisades. The rooms at the Grand Pacific Palisades range from one to three bedrooms in size, perfect for a couple's retreat or a family getaway. Equipped with relaxing master baths, fully-equipped kitchens, and modern amenities like high-speed internet access, you'll find a space that was built to accommodate the perfect California excursion. Soak in the view from your own private balcony, or stroll from your door to any number of surrounding attractions to create an unforgettable vacation with every stay. Are you ready to find the vacation solutions of your dreams? Fill out the form on this page to learn more about becoming an owner at the Grand Pacific Palisades, or call a representative at 1-877-815-4227. Owning a timeshare at the Grand Pacific Palisades resort means you'll have access to a luxury suite in Carlsbad each and every year, plus a range of exciting benefits to make your vacations exemplary. However, buying that timeshare on the resale market can provide you with another great benefit—the same amazing ownership experience for thousands less. Resales are sold by owners, not by the resort itself, meaning timeshares there are often available at discounts of up to 70% off retail prices. 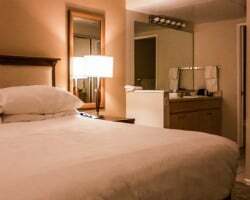 You'll find that timeshare resales at the Grand Pacific Palisades are available in the form of deeded fixed and floating Hilton timeshare weeks. Spread throughout Hilton's Gold and Platinum seasons, you'll find a variety of price points and unit sizes available on the resale market, allowing you to craft a vacation ownership solution that's perfect for you. The Grand Pacific Palisades is a part of the Hilton Grand Vacations Club, one of the most popular timeshare ownership brands in the world. As a resale owner at the resort, you'll have the opportunity to join the club and take advantage of special benefits available to members only. While you won't be able to enroll in the club at the Elite level, you can still convert your deeded week to HGVC Points to gain an easier and more flexible mode of ownership. Additionally, you can truly expand your vacation potential by spending your points at other Hilton resorts around the world and by collecting HHonors rewards. 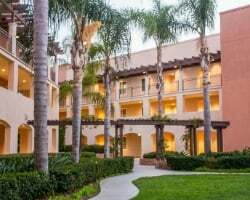 The Grand Pacific Palisades Carlsbad is also affiliated with the world's largest timeshare exchange company, opening up a whole new world of vacation possibilities for resale owners. When you obtain your own RCI membership, you can facilitate trades for your Carlsbad timeshare and discover brand new destinations all around the globe any year you choose. Simply deposit your timeshare week or Hilton points and choose from a list of comparable resorts in the RCI catalogue. What's more, the Grand Pacific Palisades has earned the Gold Crown rating from RCI, ensuring you get the highest trading power and ability to exchange at other top notch resorts. You'll find a delightful number of on-site amenities available at the Grand Pacific Palisades, each one proving capable of giving you the best vacation experience possible. For starters, there's beach access in just minutes, offering you unbridled opportunity to swim and surf among the warm Pacific waters. The resort's Olympic-size swimming pool is ideal for adults looking to cool down, while a family swimming pool is also on-site for children. Three hot tubs line the swimming area, as well as an interactive water playground. You'll find delicious cuisine at the Karl Strauss Brewery & Restaurant, and coordinated activities for children and adults alike. Enjoy pedestrian access to LEGOLAND, conveniently located right next door, as well as other amenities such as a fitness center, on-site massage services, and more. Around the local area, you'll find Carlsbad to be a place for surfers and land-dwellers alike. Head up to Oceanside for more opportunities to swim, surf, or shop, or make the short drive south the San Diego for even more attractions. Visit the famous San Diego Zoo, stroll through the Gaslamp Quarter, or lounge on one of the best beaches in the West Coast at Coronado Island. Already Own at Grand Pacific Palisades?